Bain to the rescue? It’d be more pleasant to hang yourself. Although he was talking about total spending, in reality that’d have to come out of non-defense discretionary spending because Bain would never act against the military industrial complex, and Social Security and Medicare would require changes by Congress to cut benefits, and there’s no support for that. That rules out $2.1 trillion of a $3.5 trillion budget. A 10% cut in total spending then would mean a staggering 25% drop in discretionary spending, which would mean permanently closing dozens of federal agencies that would make it impossible for the government to do things like keep Wall Street from running Ponzi schemes, keeping the food supply reasonably safe, keeping drugs from killing you, and keeping planes from crashing because it’s cheaper to do safety checks once per year instead of every few days or weeks. That wouldn’t just significantly degrade the federal government’s capabilities in public safety, it would cripple them. For those who heard about Bain Capital last year but never learned what that company does, or for those who are wondering why it’s been suggested that Bain could step in and serve this function, you have to go back to the 2012 election. 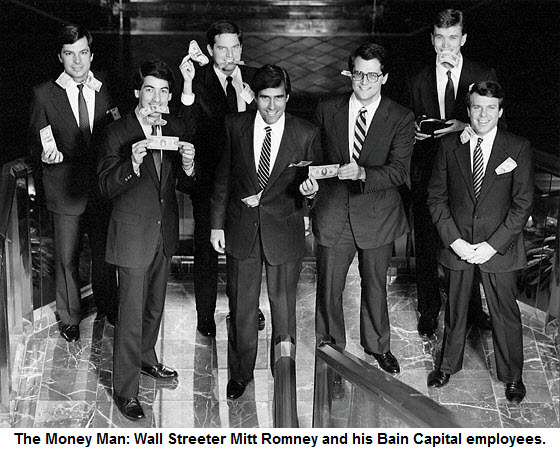 Bain Capital was the private equity firm that Mitt Romney worked for fresh out of college, and eventually ran. It’s the only private sector job he’s ever held. Bain used to do what’s called venture capital, essentially giving big loans to new startup companies that they could use to safely grow before they became profitable. That money was converted to equity — partial ownership — which the VC firm would then sell once the startup went public (or the VC firm would get a big chunk of a buyout check). What my reader was suggesting is that a person who would do the things that Mitt Romney did at Bain would be good for America by managing about a third of federal government. The idea, once you understand what Romney did at Bain and what vulture raiders like Bain do for a living, is absurd. PE raiders fire people and run up massive amounts of debt by borrowing massive amounts of money that they stick with other people for a living. What people like Romney would do with the federal government is run up even more debt that tax payers are on the hook for, while enriching corporations and making the government even less useful than it already is. Don’t forget that Romney hasn’t shown an ounce of regret for the lives and companies he’s ruined. He hasn’t shown in all these years that he even understands that what he did for most of his adult life is morally reprehensible and economically damaging. I’m sure spending can be cut in some places to minimize the economic impacts of austerity, but Mitt Romney and the vultures at Bain would be the last people that would know where to cut. And they wouldn’t care who got hurt, even if they did know. They’ve made their fortunes “cutting” things in the most painful possible areas — just not painful for themselves — in order to extract maximum profit with no concern at all about who they harm in the process. On a side note, this is one of the reasons Wall Street nearly sent America into another Great Depression. It cooked up fraud schemes like this which are highly profitable to replace traditional lending. Rather than “building” wealth through investing in company growth, like Bain used to do as a venture capital firm, they’ve been inventing one new scheme after another that simply rapes other segments of the economy of their value. And they’re doing it far quicker than Washington can criminalize these crazy schemes, and that’s only in years when Washington actually cares. Most of the time it doesn’t. Some times it actually helps create these fraud schemes. The credit default swaps at the heart of the lending crisis were schemes like PE raiding cranked up by a factor of a thousand. And the amazing thing is that not only haven’t we done anything serious to regulate and criminalize this insanity, we’ve got people advocating putting these “barbarians” in charge of the government. Paul Ryan is floating the latest GOP demands to end the shutdown and raise the debt limit in the Wall Street Journal today. Short version: Obamacare can stay until the next shutdown, Social Security benefits get cut, Medicare gets cut, and taxes for the rich and corporations cut. It’s basically everything Ryan promised as VP nominee last year that he couldn’t provide this year because he and his team lost an election based on that agenda. That’s why everyone is calling this shutdown extortion. What the GOP couldn’t attain through winning elections, they are trying to get through threats of harm. Things like this are why I wasn’t laughing, but was actually upset, that the “liberal media” let Romney-Ryan get away with saying they were trying to save Medicare with their plan that would have ended it, while accusing Obama-Biden of trying to cut benefits. It wasn’t just a lie about their opposition, it was a lie about themselves as well — the literal opposite of reality. Republicans regularly try to scale back or gut the social safety net, whether it be Medicare or Social Security, and that’s one of the reasons they’ve fought so viciously against Obamacare — it’s the third pillar. It was absurd for the GOP to run a campaign on a platform of saving all of that from Democrats when Democrats are the reason we have it all in the first place. It’s one of the reasons the 2012 election shouldn’t have been as close as it was. If the media did its job and told people what the GOP actually believes and wants to do, rather than just repeating their campaign rhetoric, the Republican Party wouldn’t be a viable national party anymore. Speaking of the Journal, one of their top stories today has this teaser: “Yellen’s Challenge: Finding a Safe Exit. David Wessel looks at the uncharted monetary-policy territory that Yellen would enter if confirmed as Fed chairwoman.” If you want biased reporting in media, you can begin with that. The reason that progressives wanted Janet Yellen over Larry Summers is because Yellen will almost certainly continue the Fed’s quantitative easing program well into the future, whereas Summers was expected to follow Ben Bernanke and end it far too soon. What the WSJ is doing is fantasizing about what it wishes Yellen would do that it knows she won’t, which in and of itself is amazing. The business side of the paper loves QE and wants more of it. It’s the politically infected opinion side, carrying water for the GOP, that wants it to end. It’s bad enough that one of the nation’s two largest political parties is manic, displaying no fewer than three distinct personalities fighting for dominance. Now one of the nation’s most influential papers is showing two faces fighting for opposite sides of the same policy.